We love kids at Shoreline Church! Our kids programming is both meaningful and fun, and geared specifically for children. All three worship hours have the same incredible worship experience. New family? Click here to learn about Shoreline and dropping off your kids. From infants to crawlers to walkers, you can be sure that your children are in good hands. Our childcare workers are more than babysitters - they want to get to know you and your child as we seek to provide a nurturing environment while you worship. While you are attending one of our worship gatherings, you can know that your children are taken care of. If we need you for any reason, we'll show your child's check-in number on the screen. If you are a nursing mother, we have a room just for you. Just head down the main stairs to bottom level and you will find the room directly on your left. A live stream of the service is provided so you don't miss a thing. Preschoolers are grouped by age for this learning time under the direction of experienced and loving teachers. We use many teaching methods with preschoolers to lay a biblical foundation for faith. These teaching methods include: art, books, blocks, puzzles, nature, and home-living activities. While you worship on Sundays, your older preschoolers, Kindergartners, and 1st Graders will experience worship in their very own way. 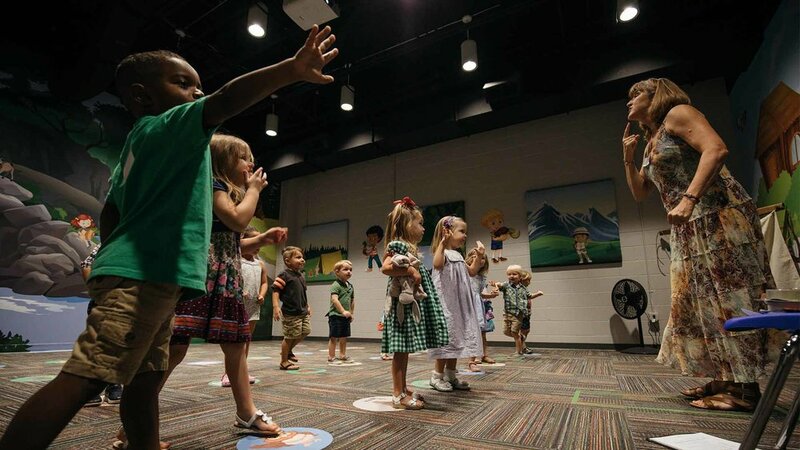 Little Cove uses energetic worship music, bible stories, videos, and games to reinforce biblical truths the preschoolers and kindergartners are learning in their classes. To participate in family dedication, you'll need to attend “First Steps” the week before Child Dedication. The date of our next Family Dedication is May 5, 2019 during our 11:00 AM gathering. First Steps will be April 28, 2019 during our 9:45 AM gathering.